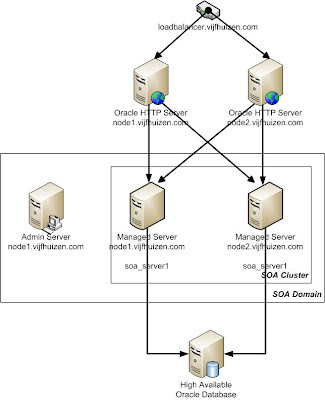 This article is a summary of the document you can download that describes in detail how to install and configure an Oracle SOA Suite11g installation.This installation is a straight forward cluster installation that assumes the following components. on the in a clustered environment. I assume that the database is high available, using Oracle RAC for example. This is shown in the next diagram. A database is available and configured with the SOA 11g repository schema's; such as DEV_SOAINSTA; DEV_MDS; etc. We will install this software on each node. On each node we create a cluster and within that cluster two managed servers; soa_server and bam_server. On one of each server, node #1, we configure the admin server. On each server we install the Oracle HTTP Server that will route the requests to the two servers. The approach of the installation is as follows. Configure Weblogic Server cluster domain definition. Pack and unpack cluster domain. This article and the document could not be created without the following documents. The document can be download here.